The Superliner is a type of bilevel intercity railroad passenger car used by Amtrak, the national rail passenger carrier in the United States. Amtrak ordered the cars to replace older single-level cars on its long-distance trains in the Western United States. The design was based on the Budd Hi-Level vehicles, employed by the Santa Fe Railway on its El Capitan trains. Pullman-Standard built 284 cars, known as Superliner I, in 1975–1981; Bombardier Transportation built 195, known as Superliner II, in 1991–1996. The Superliner I cars were the last passenger cars built by Pullman. A passenger car is a piece of railway rolling stock that is designed to carry passengers. The term passenger car can also be associated with a sleeping car, baggage, dining, railway post office and prisoner transport cars. Car types include coaches, dining cars, lounges, and sleeping cars. Most passenger spaces are on the upper level, which feature a row of windows on both sides. The Sightseer Lounge observation cars have distinctive floor-to-ceiling windows on the upper level. Boarding is on the lower level; passengers climb up a center stairwell to access the upper level. A dining car or a restaurant car, also a diner, is a railroad passenger car that serves meals in the manner of a full-service, sit-down restaurant. A lounge car is a type of passenger car on a train, where riders can purchase food and drinks. The car may feature large windows and comfortable seating to create a relaxing diversion from standard coach or dining options. In earlier times, a lounge car was more likely to have a small kitchen, or grill and a limited menu. Food was prepared to order and often cooked, though items such as club sandwiches would have usually been part of the offerings. The cars were often operated by the Pullman Company, and in other cases by the railroad directly as part of the dining car department. 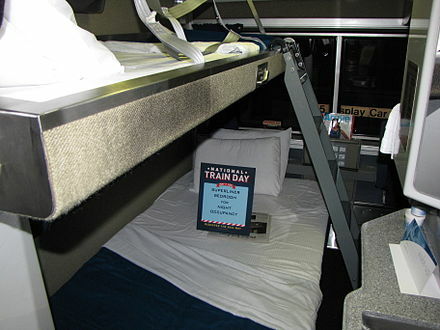 The sleeping car or sleeper is a railway passenger car that can accommodate all its passengers in beds of one kind or another, primarily for the purpose of making nighttime travel more restful. George Pullman was the American inventor of the sleeper car. The first Superliner I cars entered service in February 1979, with deliveries continuing through 1981. Amtrak assigned the cars to both long-distance and short-distance trains in the Western United States. The first permanent assignment, in October 1979, was to the Chicago–Seattle Empire Builder . Superliner II deliveries began in 1993; the additional cars enabled the retirement of the aging Hi-Level cars and the assignment of Superliners to trains in the Eastern United States. Tunnel clearances prevent their use on the Northeast Corridor. Chicago, officially the City of Chicago, is the most populous city in Illinois as well as the third most populous city in the United States. With an estimated population of 2,716,450 (2017), it is the most populous city in the Midwestern United States. Chicago is the county seat of Cook County, the second most populous county in the United States, and the principal city of the Chicago metropolitan area, which is often referred to as "Chicagoland." The Chicago metropolitan area, at nearly 10 million people, is the third-largest in the United States; the fourth largest in North America and the third largest metropolitan area in the world by land area. The Empire Builder is an Amtrak long-distance passenger train that operates daily between Chicago and – via two sections west of Spokane – Seattle and Portland. Introduced in 1929, it was the flagship passenger train of the Great Northern Railway and its successor, the Burlington Northern, and was retained by Amtrak when it took over intercity rail service in 1971. The Hi-Level was a type of bilevel intercity railroad passenger car used in the United States. The Budd Company designed it in the 1950s for the Atchison, Topeka and Santa Fe Railway for use on the El Capitan, a coach-only streamliner which ran daily between Los Angeles and Chicago. The design was inspired by two recent developments in railroading: the dome car, employed in intercity routes in the Western United States, and bilevel commuter cars operating in the Chicago area. Budd built 73 Hi-Level cars between 1952 and 1964. A request for proposal (RFP) is a document that solicits proposal, often made through a bidding process, by an agency or company interested in procurement of a commodity, service, or valuable asset, to potential suppliers to submit business proposals. It is submitted early in the procurement cycle, either at the preliminary study, or procurement stage. The Pullman Car Company, founded by George Pullman, manufactured railroad cars in the mid-to-late 19th century through the first half of the 20th century, during the boom of railroads in the United States. Through rapid late nineteenth century development of mass production, and takeover of rivals, the company developed a virtual monopoly on production and ownership of sleeper cars. At its peak in the early 20th century, its cars accommodated 26 million people a year, and it in effect operated "the largest hotel in the world". Its production workers initially lived in a planned worker community named Pullman, Chicago. Pullman developed the sleeping car, which carried his name into the 1980s. Pullman did not just manufacture the cars, it also operated them on most of the railroads in the United States, paying railroad companies to couple the cars to trains. The labor union associated with the company, the Brotherhood of Sleeping Car Porters, founded and organized by A. Philip Randolph, was one of the most powerful African-American political entities of the 20th century. The company also built thousands of streetcars and trolley buses for use in cities. Post World War II changes in automobile and airplane transport led to a steep decline in the company's fortunes. It folded in 1968. Top: Waggon Union truck from Superliner I car. Bottom: GSI truck from Superliner II car. The interior of the upper level of Superliner I coach No. 34960. 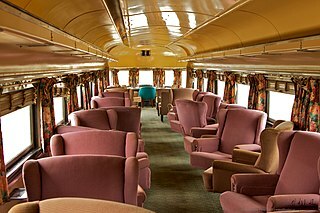 This coach was rebuilt in the 2000s for use in California service and has expanded seating. The Superliner I coach has a full row of windows along the upper level seating area. The Superliner lounge cars have windows that curve over parts of the ceiling. California Cars were the first generation of Superliner derivatives. ↑ Kelly, John (June 5, 2001). "Amtrak's beginnings". Classic Trains. Retrieved September 13, 2016. ↑ "Railroad Sleeping, Passenger Cars Are Ordered By Amtrak". Valley Morning Star . April 2, 1975. p. 39. Retrieved February 7, 2017– via Newspapers.com. ↑ "From Ugly Duckling To Graceful Swan". On Track. 1 (1): 13. June 1981. ↑ Gruber, William (December 14, 1975). "No longer a sleeping giant, Pullman growing overseas". Chicago Tribune . ↑ Shifrin, Carole (October 12, 1979). "Supertrain Coming on 7 Amtrak Routes". The Washington Post . Retrieved September 19, 2017. ↑ "Name The Bi-Level Contest Winners Picked". Amtrak NEWS. 4 (10): 2. June 1977. ↑ Ingles 1979a , p. 14: "For aboard train 337 when F40PH No. 230 accelerated coaches 34014 and 34013 out of Union Station..."
1 2 Sheppard, Nathaniel, Jr. (October 12, 1979). "Amtrak Unveils a 'superliner' Fleet of Rail Cars for Its Western Routes". The New York Times . Retrieved September 19, 2017. ↑ "National Train Timetables". Amtrak. October 28, 1979. ↑ "Untitled" (PDF). The Trainmaster (237): 3. February 1981. ↑ "Commendation–National Railroad Passenger Corporation". H.C.R. 64, of February 20, 1981. p. 4061. 1 2 Gormick, Greg (June 6, 1987). "How to beat the railway blues: Amtrak given new car boost but VIA stuck with old stock". The Toronto Star . p. B4. ↑ Stewart-Patterson, David (June 11, 1986). "Via Rail close to deal on double-decker cars". The Globe and Mail . p. B7. ↑ Brunt, Stephen (February 20, 1985). "Via Rail seeking two-tier coaches". The Globe and Mail . ↑ Phillips, Don (April 23, 1991). "Amtrak to Bring Double-Decker Trains to D.C." Washington Post . Retrieved September 19, 2017. ↑ "Amtrak Orders 55 Cars". The New York Times . December 9, 1993. Retrieved September 19, 2017. 1 2 3 4 5 6 "United States – Bi-level Superliner II". Bombardier Transportation. Archived from the original on April 12, 2001. Retrieved September 22, 2017. ↑ National RR Passenger Corp. v. State of Nev. , 776F.Supp.528 (D. Nev.1991). ↑ Campbell, Joel (August 21, 1988). "Amtrak Accused of Dumping at Helper". Deseret News . Retrieved September 19, 2017. ↑ "...And Congress Puts a Lid on It" (PDF). The Trainmaster. May 1991. p. 5. ↑ ""Somethin' Special": A Superliner History". History Blog. Amtrak. September 30, 2013. ↑ McGee, Bill (November 5, 2014). "Tale of the tape: Amtrak is more comfortable than airlines". USA Today . Retrieved September 19, 2017. 1 2 3 4 5 6 Mashburn, Craig. "Superliner Equipment". Amtrak Car Diagrams. ↑ "Smoking Cars". RailNews (401): 27. April 1997. ↑ "Analysis of Cost Savings on Amtrak's Long-Distance Services" (PDF). Office of Inspector General for the Department of Transportation. July 22, 2005. p. 9. ↑ Sachs, Ben (May 21, 2012). "A memory of the smoking car". Chicago Reader . Retrieved September 19, 2017. ↑ Bandrapalli, Suman (October 19, 1997). "More travelers opting for the rails". Chicago Sun-Times . Archived from the original on August 28, 2017. Retrieved January 7, 2017– via HighBeam Research. (Subscription required (help)). ↑ "Amtrak Coast Starlight to offer Business Class Service" (PDF) (Press release). Amtrak. July 2, 2015. Archived from the original (PDF) on February 7, 2016. ↑ "Rolling Stock Roster". On Track on Line. December 31, 2016. Retrieved January 7, 2017. ↑ "Superliner Roomette". Amtrak . Archived from the original on January 5, 2017. Retrieved January 15, 2017. ↑ "Superliner Bedroom". Amtrak . Archived from the original on August 19, 2016. Retrieved January 15, 2017. ↑ "Superliner Family Bedroom". Amtrak . Archived from the original on August 19, 2016. Retrieved January 15, 2017. ↑ "Superliner Accessible Bedroom". Amtrak . Archived from the original on August 19, 2016. Retrieved January 15, 2017. ↑ "Superliner Bedroom Suite". Amtrak . Archived from the original on August 4, 2016. Retrieved January 15, 2017. ↑ Young, David (January 25, 1981). "Amtrak upgrading its western trains". Chicago Tribune . ↑ "Piano lounge in a Sightseer Lounge car, 1980s". 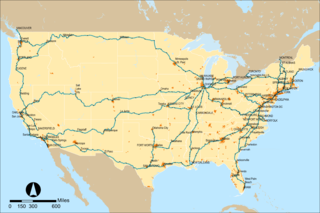 Amtrak: History of America's Railroad. March 7, 2014. ↑ "20th Anniversary Report" (PDF). Metrolink. 2012. p. 5. ↑ "Caltrans Amends Multimillion Dollar, Multi-State Railcar Contract" (Press release). Caltrans. November 8, 2017. First class is the most luxurious travel class of seats and service on a train, passenger ship, airplane, bus, or other system of transport. It is usually more expensive than business class and economy class, and offers the best service and luxurious accommodation. The Broadway Limited was a passenger train operated by the Pennsylvania Railroad (PRR) between New York City and Chicago. It operated from 1912 to 1995. It was the Pennsylvania's premier train, competing directly with the New York Central Railroad's 20th Century Limited. The Broadway Limited continued operating after the formation of Penn Central (PC) in February 1968, one of the few long-distance trains to do so. PC conveyed the train to Amtrak in 1971, who operated it until 1995. The train's name referred not to Broadway in Manhattan, but rather to the "broad way" of PRR's four-track right-of-way along the majority of its route. The Super Chief was one of the named passenger trains and the flagship of the Atchison, Topeka and Santa Fe Railway. It claimed to be "The Train of the Stars" because of the celebrities it carried between Chicago, Illinois, and Los Angeles, California. A dome car is a type of railway passenger car that has a glass dome on the top of the car where passengers can ride and see in all directions around the train. It also can include features of a coach, lounge car, dining car, sleeping car or observation. Beginning in 1945, dome cars were primarily used in the United States and Canada, though a small number were constructed in Europe for Trans Europ Express service, and similar panorama cars are in service on Alpine tourist railways like the Bernina Express. The North Coast Limited was a named passenger train operated by the Northern Pacific Railway between Chicago and Seattle via Bismarck, North Dakota. It started on April 29, 1900, and continued as a Burlington Northern Railroad train after the merger on March 2, 1970 with Great Northern Railway and the Chicago, Burlington and Quincy Railroad. The next year, it ceased operations after the trains which left their originating stations on April 30, 1971, the day before Amtrak began service, arrived at their destinations. 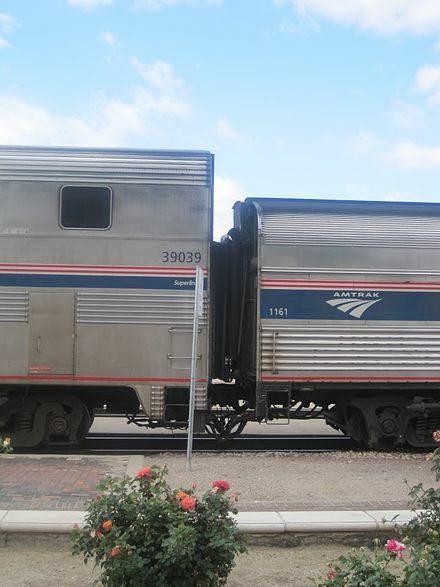 Amfleet is a fleet of single-level intercity railroad passenger cars built by the Budd Company for American company Amtrak in the late 1970s and early 1980s. Budd based the Amfleet design on its earlier Metroliner electric multiple unit. An initial order for 57 cars in 1973 to supplement the Metroliners on the Northeast Corridor grew to two orders totaling 642 cars, sufficient to reequip all the services on the Northeast Corridor and many other routes around the United States. The first 492 cars, known as Amfleet I and completed between 1975–1977, were designed for short-distance service. A second order of 150 cars, known as Amfleet II and completed between 1980–1983, were designed for long-distance service. They were the last intercity passenger cars built by Budd. The Capitol Limited was an American passenger train run by the Baltimore and Ohio Railroad, originally between New York City and Grand Central Station in Chicago, Illinois, via Union Station, Washington, D.C., and Pittsburgh. For almost 48 years, it was the B&O's flagship passenger train, noted for personalized service and innovation. At the time of its discontinuation on May 1, 1971, when Amtrak took over most rail passenger service in the U.S., the Capitol Limited operated between Washington and Chicago. The Viewliner is a single-level car type used by Amtrak on most long-distance routes operating east of Chicago. The first production cars, consisting of an order of 50 sleeping cars, were put into service in 1994. On March 23, 2015, Amtrak began putting 70 new Viewliner II baggage cars into service, and delivered the final car in 2016. The new baggage cars are used on all Amtrak trains with full baggage cars, single-level and bi-level. They replaced all of the Heritage Fleet baggage cars that Amtrak inherited from the freight railroads when it was created in 1971. The first of the 25 Viewliner II dining cars entered service in late December 2016, and the last was delivered in February 2019. One of the 10 baggage-dorms and one of the 25 sleepers have been delivered, though neither have entered service. The Lone Star was an Amtrak passenger train serving Chicago, Kansas City, Oklahoma City, Fort Worth, Houston and intermediate points. The train was renamed from the Texas Chief, which the Atchison, Topeka and Santa Fe Railway had introduced in 1948. Amtrak discontinued the Lone Star in 1979. The Challengers were named passenger trains on the Union Pacific Railroad and the Chicago and North Western Railway. The economy service ran between Chicago, Illinois, and the West Coast of the United States. The trains had full Pullman service and coach seating and were an attempt to draw Depression-Era riders back to the rails. Food service was advertised as "three meals for under a dollar a day." A roomette is a type of sleeping car compartment in a railroad passenger train. The term was first used in North America, and was carried over into Australia and New Zealand. Roomette rooms are relatively small, and were generally intended for use by a single person; contemporary roomettes on Amtrak, however, include two sleeping berths. The Cascade was a passenger train of the Southern Pacific on its route between Oakland, California, and Portland, Oregon, with a sleeping car to Seattle, Washington. The Southern Pacific started the train on April 17, 1927, soon after the opening of its Cascade Line between Black Butte, California, and Springfield, Oregon. The Horizon is a single-level model of rail car used by Amtrak, primarily on short-haul corridor routes in the Midwestern United States. Bombardier Transportation built 104 of the cars in 1988–1990 based on the Comet II commuter coach design. The Mainstreeter was a passenger train on the Northern Pacific Railway between Chicago, Illinois, and the Pacific Northwest from 1952 to 1971. When the North Coast Limited got a faster schedule in November 1952 the Mainstreeter was introduced, running roughly on the North Coast's old schedule but via Helena. Unlike the North Coast the Mainstreeter was not a true streamliner as it carried both new lightweight and traditional heavyweight coaches. It replaced another train, the Alaskan. The name referred to the Northern Pacific's slogan, "Main Street of the Northwest." While Amtrak did not retain the train as part of its initial route structure, it created a new train named the North Coast Hiawatha several months afterwards. That train ran until 1979. CALIDOT is a fleet of single-level intercity railroad passenger cars under construction by Siemens Mobility for American rail operator Amtrak. The name is a portmanteau of Caltrans and IDOT, the two state transportation agencies leading the procurement. The fleet of 137 railcars will include seven 7-car trainsets for Amtrak California routes and 88 cars for Midwest routes. They will supplement and replace single-level Amfleet and Horizon cars in the Midwest and bilevel Surfliner and California cars in California. "The Journal". Passenger Train Journal . 11 (4): 5–7. August 1979. ISSN 0160-6913. "Superliner Specs". Passenger Train Journal . 11 (8): 8–10. December 1979. ISSN 0160-6913. "Amtrak's Passenger Trains" (PDF). Amtrak. August 1990. Amtrak (June 27, 2017). "Amtrak Five Year Service Line Plans: Fiscal Years 2017–2021: Long Distance Service Line" (PDF). p. 3. Bing, Alan J.; Berry, Shaun R.; Henderson, Hal B. (1996). Design Data on Suspension Systems of Selected Rail Passenger Cars (PDF). 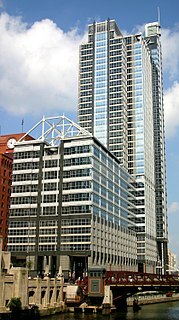 Washington, D.C.: Federal Railroad Administration. Griswold, Wesley S. (January 1957). "Riding the Santa Fe's Split-Level Train". Popular Science : 136–139, 240–241. Ingles, J. David (May 1979). "How super are the Superliners?". Trains . 39 (7): 14. ISSN 0041-0934. Ingles, J. David (June 1979). "Superliner high points". Trains . 39 (8): 16–17. ISSN 0041-0934. Johnston, Bob (June 1992). "Amtrak's design on the future". Trains . 52 (6): 32–41. ISSN 0041-0934. Johnston, Bob (December 1993). "Superliner II's make their debut". Trains . 53 (12): 36–38. ISSN 0041-0934. Johnston, Bob (August 2017). "There's Beech Grove". Trains . 77 (8): 22–23. ISSN 0041-0934. National Transportation Safety Board (April 3, 1980). "Head-end Collision of Amtrak Train No. 392 and ICG Train No. 51, Harvey, Illinois, October 12, 1979" (PDF). Solomon, Brian (2014). GE and EMD Locomotives: The Illustrated History. Minneapolis, Minnesota: Voyageur Press. ISBN 978-0-7603-4612-9. "Crossing Collision/Derailment Via Rail Canada Inc. Passenger Train No 85 Mile 33.54, Goderich-Exeter Railway (GEXR) Guelph Subdivision Limehouse, Ontario". Transportation Safety Board of Canada. December 17, 2002. Retrieved January 15, 2017. Weinman, Michael R.; Cavanaugh, Raymond R. (August 1982). "How to Design a Superliner". Trains . 42 (10): 26–30. ISSN 0041-0934. "Specification Evaluation Criteria - Bi-Level Intercity Car: Rev. A" (PDF). PRIIA 305 Next-Generation Equipment Committee. February 14, 2012. pp. 30–33. "Bi-Level Passenger Rail Cars Standardized Technical Specification" (PDF). PRIIA 305 Next-Generation Equipment Committee. September 20, 2012. pp. 1–5. Hunter, Stanton C.; Highfill, Robert C. (2013). Implementation of the Nation's First Standardized Intercity Rail Car Specification (PDF). AREMA 2013 Annual Conference. American Railway Engineering and Maintenance-of-Way Association. pp. 579–599. Fleming, Susan A. (May 2016). RAIL GRANT OVERSIGHT: Greater Adherence to Leading Practices Needed to Improve Grants Management (PDF) (Report). United States Government Accountability Office. GAO-16-544. Wikimedia Commons has media related to Superliner passenger cars .